Hello!! Welcome back to this series of Reiki blogs! How are you enjoying them? Let me know in the comments! Once you are practicing Reiki as an attuned practitioner, there is a lot you can do to be in flow with Reiki energy, you may (or may not!) be surprised that much of it involves building a powerful, trusting relationship with your intuition! 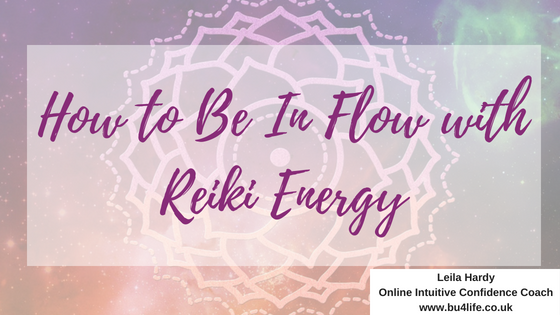 How can you be in flow with Reiki energy? Other than the obvious one, practicing working with Reiki every day in some way, there are many ways to continue to hone and refine your journey with Reiki energy. BE A STUDENT: I don’t think there has been one day since my first attunement that I haven’t used Reiki in some way on myself, and learned and developed new intuitive gifts and skills as a result, that I've been able to transfer to working with my clients. Being a student amplifies your awareness of the Chakras, Auras, energy meridians, and so much more. BECOME AWARE: The more you become aware of how Reiki energy feels for you, the more you can amplify them-sensing warmth for instance, can mean physical issue is being picked up or needs healing, a buzzing sensation in your hands may mean emotional challenges are presenting to be cleared, cold sensations in your hands can mean spiritual, old wounds or scars are presenting to be healed. SELF-CARE: This is paramount to maintaining a clear vessel to be in flow with Reiki energy-meditation, stillness-the more you use them, the stronger the flow of Reiki energy. Eat clean, stay hydrated, support your chakras to enhance and amplify your flow of Reiki energy! CONNECT DOWN & UP: Ground your energy to the Earth and connect upwards to Source-this two way connection often gets overlooked! USE BOTH SIDES OF YOUR BRAIN: The right hand side of the brain is visual, intuitive and creative; the left hand side is logical, analytical, verbal: Using both sides creates psychic synergy which amplifies your intuition and ability to receive and send Reiki and flow with it! MAKE REIKI ENERGY YOUR OWN: There is no right or wrong the it comes to Reiki energy, no one persons experience of receiving Reiki healing is exactly the same as another’s, so allow yourself to explore what feels right and true for you around your Reiki energy. PRACTICE INTERPRETING THE MEANINGS YOU RECEIVE: Often when in flow with Reiki energy, intuitive messages can be received. Using your intuition will guide you to support yourself with Reiki energy and others, should they wish to receive intuitive Reiki healing from you. CONTINUE TO GROUND YOUR INTUITIVE INSIGHTS WHILST IN FLOW WITH REIKI ENERGY: It can be exciting to receive intuitive messages that are correct or aligned with what's going of for you, or what your client shares with you, but be sure to keep that energy coming down into your lower body and chakras, otherwise you may feel dizzy, like a headrush and you may get tired and burned out in the long run. CHECK IN WITH YOUR EGO-EGO AND INTUITION CAN OFTEN GET MIXED UP: Note the feelings you pick up on, discern whether they may be Ego or Intuition and practice noticing the difference. Ego oftentimes feels doubtful, heavy and unsure. Intuition comes without doubt and feels good, even if scary-WHEN you trust the messages you are receiving! So there you have it, a few ways to be in flow with Reiki energy. What did you learn here that you didn't already know?